This Cockroach Killer Kit enables you to carry out a comprehensive cockroach treatment to one room or a small kitchen. The combination of insecticides in the Kit delivers a rapid knockdown of cockroaches and helps maintain long-lasting cockroach control. 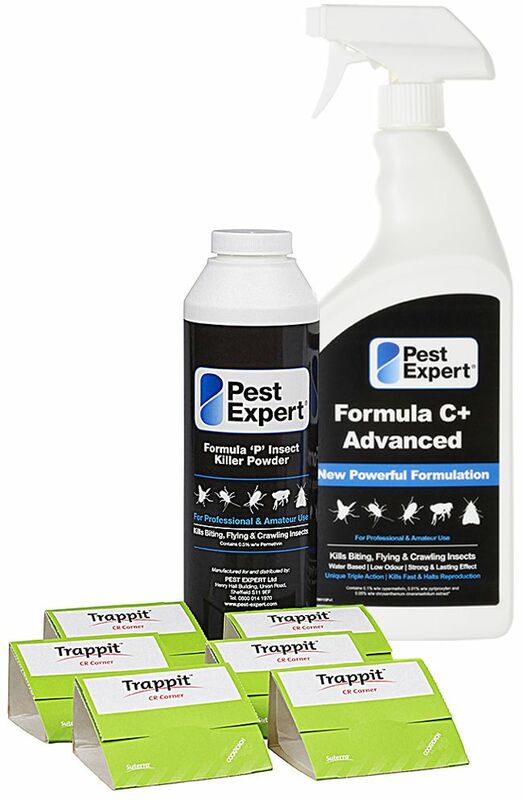 1 x Pest Expert Formula 'C+' Cockroach Spray 1L: For application to floors, kitchen surfaces or anywhere in the home or workplace for effective control of cockroaches. Covers 20 sq m.
1 x Pest Expert Formula 'P' Cockroach Powder: For application to cracks, crevices and in areas where electrical equipment may be present and a water based spray cannot be administered. 6 x Cockroach Traps: Poison-free and pre-baited traps for trapping and killing cockroaches, locating harbourages and monitoring activity following insecticide treatment. The Kit is also supplied with step-by-step instructions to explain how to carry out a complete professional-standard cockroach treatment using the cockroach products provided. This kit is sufficient to treat one room. Full instructions are included with the Cockroach Treatment Kit 1. Product worked to eradicate the little pests very quickly this worked for me. Good supplier. The goods came very quickly!